Valentine's Day Favorites From Shabby Apple! I recently shared how much I love my Nutcracker Dress from Shabby Apple, so it probably comes as no surprise that I want to share more of my favorite pieces in their collection. With an amazing 30 to 75 percent off of everything sale happening RIGHT NOW, you are bound to find something stunning to add to your wardrobe! Plus, with Valentine's Day coming up on us quickly, I wanted to share a little shopping guide (and/or wishlist) of the perfect flirty frocks to rock! So go ahead and grab your credit card, you're about to meet your soul mate in dress form! We'll start with this beauty, the "With this Ring Rose Dress" features an antique pink under a layer of cream lace. This dress just exudes class and femininity and would be perfect to wear on a Valentine's Date... and don't be surprised if your date wants to say I do when he sees you in this gorgeousness. If you want to have a fun Valentine's Day, you have to dress the part! With a rainbow of colors and a playful diamond print, this Tutti-Frutti pencil skirt is bound to have you playing the leading role in a rom-com type romance by the end of the day! The "Kissed with Gold Dress" is another funky little piece on my wishlist! This eye-catching dress features a gorgeous shade of hot pink and a stunning gold print over the top, totally fun and quirky. If you want to make people stop in their tracks, this frock is the one to rock! The next item on my list is the Morgan Skirt. With a fun, flirty floral print and a chic tulle overlay, this feminine piece makes for a romantic outfit for a day date with your honey! The Ornament dress is an eye-catching mixture of festive and adorable, making for fun all year long. With a gorgeous floral print and a fitted cut, you'll wow everyone in this number. 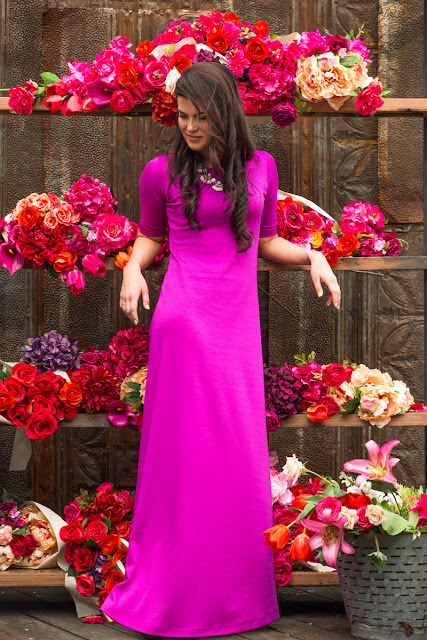 The last item on my Valentine's Day wish list is this gorgeous bright "Magenta Moment" dress. It's a long gown and one of the most stunning dresses I've seen in a long time. If you're planning on having a ball, literally or figuratively, this gorgeous dress is the perfect one! So tell me, which dress on the list is your favorite? Did you spot a dress on the Shabby Apple site you just have to add to your closet? I'd love to hear all about it in the comments below!